What a morning! It really was "for the birds!" While eating my Mini-Wheats I watched hummingbirds, goldfinches, blue jays, orioles and cardinals coming to our feeder and birdbath. As I was leaving for the "transfer centre" which is really THE DUMP, a hawk flew overhead and then, seconds later, a great blue heron passed over the trees. While unloading "junk" at the dump, a bald eagle flew over, chasing a hawk with a fish in its mouth. It was the first time I've seen a bald eagle in the wild and it looked incredible. Earlier, while Carol and I were still in bed, we heard a different bird song than we've noticed before. The bird would make about eight (8) short calls and then let our another eight or so in quick succesion. Any bird watchers out there that can help us with this? God has given us so many things to enjoy! Let's pause to thank Him for His creative work and power. AMEN! The bird that you and Carol heard sounds like a wood-pecker David but I am no expert, so I am really just guessing. 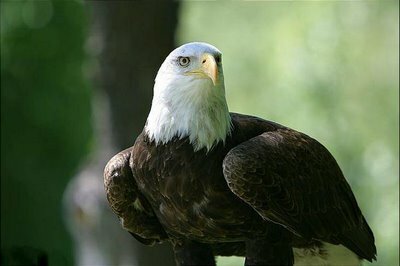 This is such a nice picture that you took of the eagle.. They are such a majestic bird!! I find even with my zooming in of the camera lens, I don't have the same luck as you David. You have a lot of patience!! I feed the birds at Katy's, always bringing in a bird seed supply from home. I have taken several pictures of what I call the "Smorgasbord at the Castle" and have been wanting to put them on my blog but then I have put it off for so long that it will probably be winter before I put in the effort to do so! And it just wouldn't strike true because even the birds don't like an outside picnic in the cold of winter! !